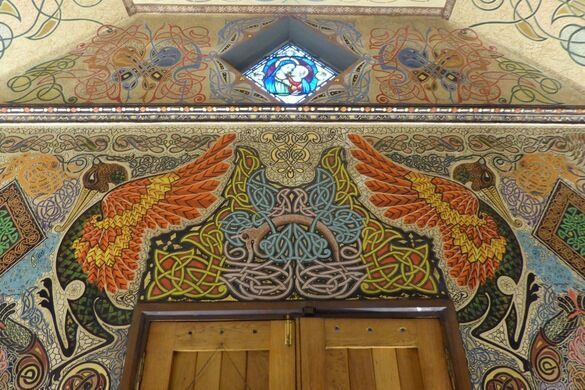 There’s a mind-blowingly beautiful display of Celtic Revival artwork hidden in plain sight near a playground and a parking lot in Dún Laoghaire, Ireland. 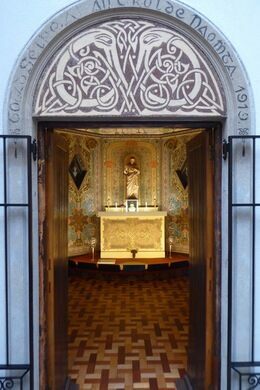 Stepping into the Oratory of the Sacred Heart, which doesn’t look like much from the outside, reveals a stunning mural that stretches across the entire interior of the small red structure. 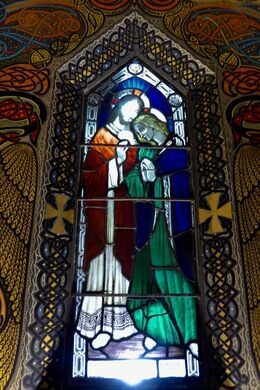 The oratory (a small chapel) was built to be a memorial that celebrated the end of World War I and honored the local Irishmen killed in battle. Bright, vibrant symbols and illustrations fill nearly every inch of the space. 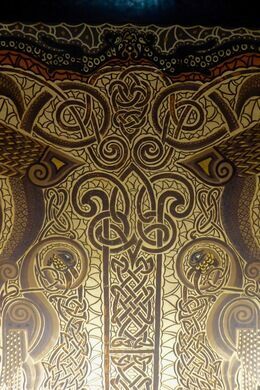 It’s full of Celtic knots, spirals, animals, and crosses, all so rich with color they almost appear to glow. 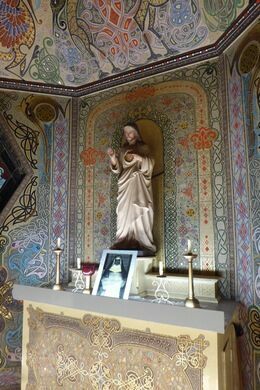 The tiny seaside town began using the oratory after receiving a statue of the Sacred Heart from a town in Northern France where many of the local men had fought and died. Sister Concepta Lynch began painting the wall behind the statue after the statue was installed in 1919. People liked her mural so much they encouraged her to expand it. 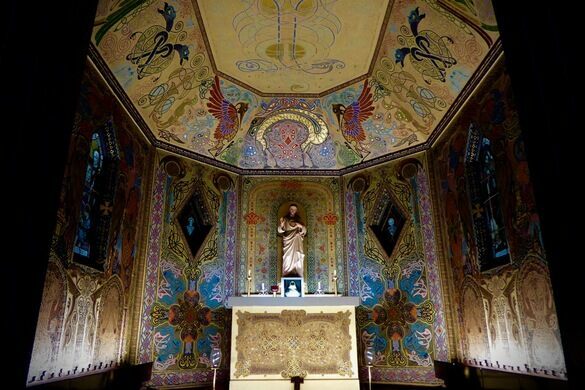 The nun spent 16 years transforming the oratory into the breathtaking masterpiece it is today. 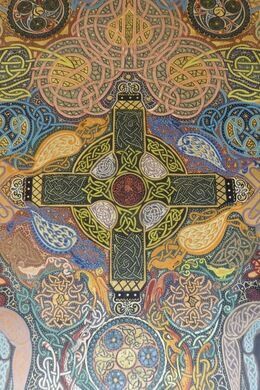 Sister Concepta Lynch mainly included themes from early Irish Christian art, but she was also influenced by a variety of sources such as the Book of Kells, a few Islamic designs, and even the Lynch Style of Celtic Art which was originated by her own father. 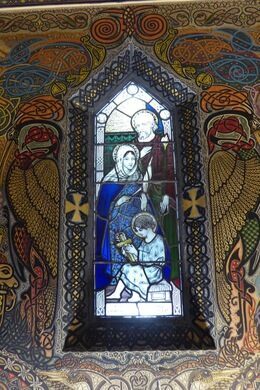 In addition to the statue and mural, the chapel contains stained glass windows that were made by Ireland’s famous Harry Clarke Studio. The building itself even won awards for its modern architecture. Access is extremely limited and visitors are only permitted during local council heritage seasons in the spring and summer. It sometimes opens in October for an open house. 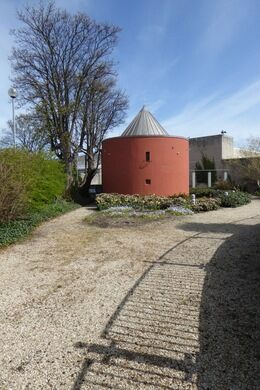 It is located not too far from Dún Laoghaire Library. There might not be much left of these Irish ruins, but their linguistic legacy is still going strong. These colonial murals are a fascinating hybrid of Spanish and indigenous aesthetics. The 16th-century church was kept in its ruined state as a reminder of the casualties of World War I.